Proper variety selection is one of the most important steps a soybean producer can make. It is important to devote some time to selecting the proper variety as this decision is one of the first steps to maximizing yields. If we compare the top 10% of soybean varieties grown within a single maturity group at a single location in the OVT to the bottom 10%, we can see as much as a 15 bu/ac difference in yield. Therefore, selecting the right variety for the right environment is essential. There can be as much as a 15 bu/ac difference in different varieties grown in the same field. But with more than 200 soybean varieties available to NC growers, this can be an overwhelming decision. 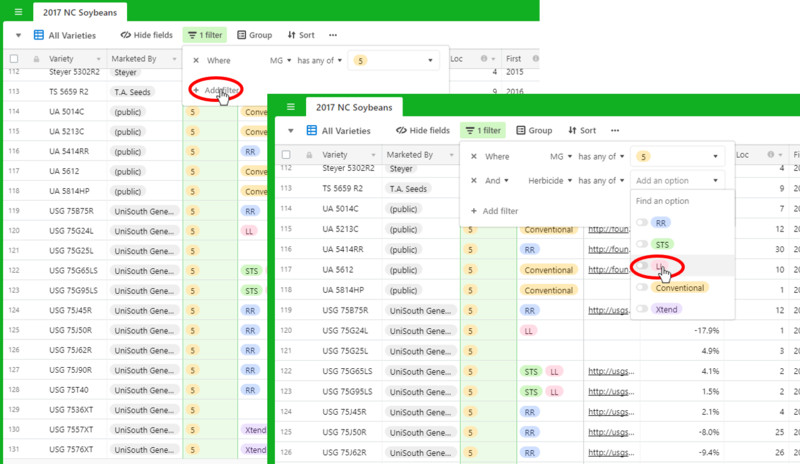 To help make this job easier for you, the NC Soybean Producers Association has developed a Soybean Variety Selector Database Tool. The information available in the OVT Data has been compiled into a single database that can be filtered, searched, and sorted. The database has been updated with results from the 2018 OVT testing and includes data that was collected in the NC OVT. You can filter by maturity group, herbicide technology, company, disease resistance, and more. You can also sort by yield. In this updated database, yield is reported both as the actual yield across all locations and as a percent. This is the percent above or below the average yield of all varieties in that maturity group, tested at the same locations. Yield data is available for early planted beans (May planting), late planted beans(June planting) and a combined average (overall yield) of the two planting dates. To export or print this database, click the ‘…’ button at the top of the database (beside ‘Sort’). For more hints and tricks, see this page. Below we will walk through an example of how to use the database. In this example, we are want to see all group 5 Liberty Link varieties. And we want to sort these by their performance when planted early. Click ‘View larger version’ in the bottom right-hand corner of the tool. This will open up a new tab which allows you to see the entire database at once which included all varieties from all maturity groups. We want to see only the varieties that meet our criteria (MG 5, LL, ) so we need to add a few filters. Click the ‘Filter’ button at the top of the database and you will see there are currently no filters applied to this view. Click ‘Add Filter’ and a line will appear that says ‘Where Variety contains’. Notice there are down arrows beside ‘Variety’ and ‘contains’. This is where we will select the filters we want. The first filter we need is for MG. So click the down arrow beside ‘Variety’ and you will see a list of all fields in the database. Scroll until you see ‘MG’ and click it. When you click MG, you will see ‘contains’ changes to ‘has any of’ and a box with ‘Add an option’ appears. Click the down arrow in that box and you will see options for MG’s 4-8. We want MG 5 so we’ll select ‘5’. When you select ‘5’, you will notice we now only MG 5 varieties in our list. We also only want varieties that are Liberty Link so we need to add an additional filter, just like we added the MG filter. Click ‘Add filter’ and this time we want to select ‘Herbicide’ in the drop-down list and then ‘LL’. When you select ‘LL’ you will now only see MG 5, LL varieties in our list. Now the last thing we want to do is sort these by yield when they were planted early. Click ‘Sort’ at the top of the database and you will notice these varieties are actually sorted by MG and then in alphabetical order by variety. Since we want to see them ordered based on yield we need to remove those sorts by clicking the ‘X’ beside each line. 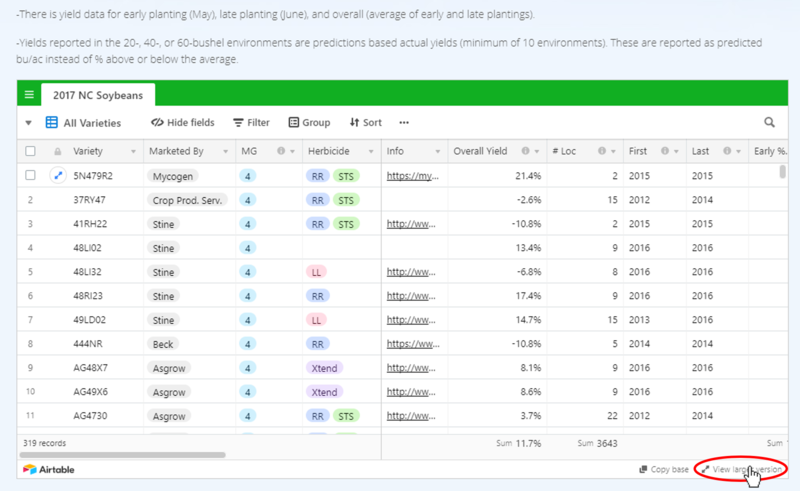 This removes the sorting requirements and now we can add a sort by yield when planted early. Click ‘Add a sort’. And you will see a ‘Sort by’ line appear that has ‘Variety from A->Z’. 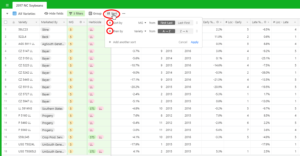 Click the down arrow beside variety and scroll to the ‘Early Yield (%) – Multiyear’ field. 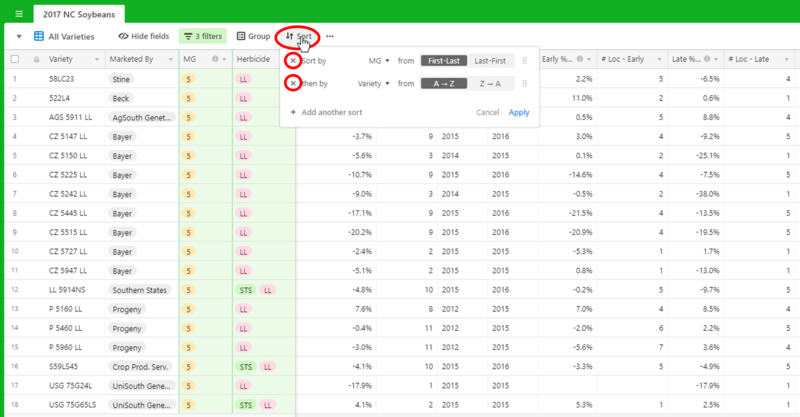 Then we want to select the 9 -> 1 options since we want the highest yields to be at the top (descending order). Click ‘Apply’ to apply this sort. This will return a list of varieties that are MG 5, LL, sorted by yield when planted early. 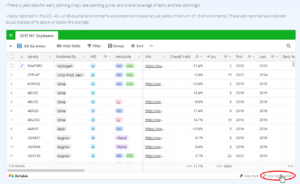 If you’d like more info about each of the varieties in the list you can scroll back and forth across the different fields to see things such as other disease resistance, hilum color, lodging susceptibility, and more. You can also click on the link in the ‘Info’ column which will take you to the company’s info page for that variety. When using this data to select a variety, it is important to not only look at yield but also at the number of locations a variety was tested in. The more locations we have data in, the more confidence we have in the accuracy of the yield data. You should be wary of yield data from varieties with less than 2 years of testing or fewer than 10 different locations. I would also encourage you to look at the Multiyear data before you look at the 2017 data, as the multiyear day has more “information” in it and therefore, should be more reliable. This is just one example of a filter and sort that can be carried out. I’d encourage you to play with the selector as you make your variety selection decisions this season. If you have any questions about how to use this tool please don’t hesitate to contact us! Note: The North Carolina Soybean Producers Association recommends nor discourages the use of any variety, and are not liable for the use or misuse of the information provided. The information contained herein has been compiled from sources deemed reliable and it is accurate to the best of our knowledge; however, we cannot be held liable for any errors or omissions. Changes are periodically made to this website and may be made at any time.